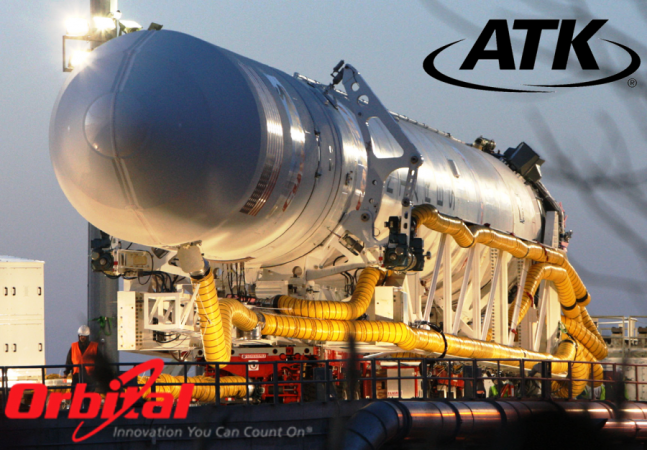 Dulles, Virginia-based Orbital Sciences Corporation’s stockholders have approved a merger with the Aerospace and Defense Groups of Alliant Techsystems Inc. (ATK ), based out of Utah. The newly-formed Orbital-ATK will officially begin operations on Feb. 10 – the day after the merger is officially closed. The announcement comes after a special meeting held on Jan. 27. According to a news release issued by Orbital, stockholders “overwhelmingly” supported the merger. The definitive transaction date is Apr. 28, 2014. About 99 percent of the votes cast were in favor of the merger with 85 percent of the total number of outstanding shares of Orbital’s common stock as of the Dec. 16, 2014 record date for the special meeting. This is according to Orbital’s release. There is still a waiver which might alter the exact closing date of the merger. The waiver concerns the conditions which still remain to be finalized. If everything goes according to plan Orbital’s common stock will be delisted at the close of trading on Feb. 9. The merger will cause the stock to be converted into the right to receive 0.449 shares of common stock of ATK, with cash paid in lieu of fractional shares. After Feb. 10, a new company, Orbital ATK will begin trading on the market as “OA” on the New York Stock Exchange. ATK provides the CASTOR solid rocket motors that are used on Orbital’s Antares line of launch vehicles that is contracted to ferry experiments, cargo and crew supplies to the International Space Station under the $1.9 billion Commercial Resupply Services contract that Orbital has signed with NASA. Mergers are very common in the aerospace industry with Lockheed Corporation and Martin Marietta merging in 1995 and Aerojet and Pratt & Whitney Rocketdyne combining in 2013. Meanwhile Orbital is refusing to pay for the damage they caused to the Wallops Launch Pad. Tom…Congress authorized 20 million bucks to do it. If Congress steps in & gives money freely to repair the damage let them. Appropriated funds for a certain project means that it has to be spent on that project. So, Orbital gets off the hook. Hey Tom, I’m hearing the same thing from the folks I know working up there. Orbital is shrugging their responsibilities in paying up. As Art above says; even though the government may pay, it shows how irresponsible Orbital is. In fact I read an article a while back about how Orbital doesn’t like to pay their bills. This one case, Orbital contracted a company to make some parts and then didn’t want to pay them. When Orbital refused to pay, the company refused to deliver and Orbital sued them. My contacts at Wallops are telling me the same thing. The government is dragging their feet in paying what they promised, therefore, The launch pad reconstruction is being delayed because Orbital won’t pay for the damage they caused. I wonder how long it will take “Orbital-ATK” to abandon OSC’s recent decision to employ the Russian-built RD-181 on the first stage of the Antares and instead use an ATK-built solid rocket motor instead.